Evie turned 2 today! She got lots of great presents in the morning, then we headed of to Daisy Hill Koala Sanctuary for a look around, and then a picnic lunch. My parents (Evie's grandparents) spent the last 6 days with us, and flew home tonight, so it was good that they got to share her birthday with us. 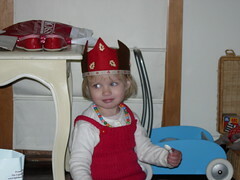 Thank-you to all who sent her cards and presents, she has much to play with/read and wear now! You can view other photos from her birthday through our Flickr link. 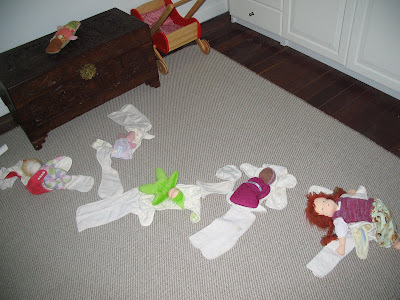 I found this picture quite interesting: Evie had found one cloth nappy for each of her 5 dolls in her room. Might be time to make some tiny doll nappies! If only I could find the motivation. 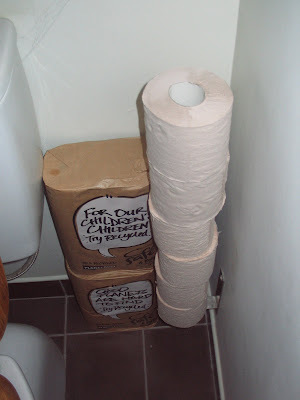 This is one of my favourite environmental tips for around the home: use recycled paper toilet paper. 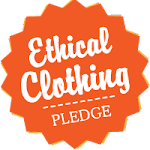 You see, if you're going to go to the effort of recycling your papers, bottles, jars, cans and so forth, you also need to close the loop and buy products made from recycled goods. Brown toilet paper is an easy way to get started, it even comes packaged in recyclable brown paper. Recycled paper toilet paper has come along way, it is no longer scratchy, and you can even get it in white and I think peach, if brown doesn't suit your toilet decor :) It's quite cheap too, and Aldi (in Australia) sells it for nearly $1 cheaper for 6 rolls than other major supermarkets. All those trolleys filled with velvety soft, aloe vera infused, gardenia scented, white and printed toilet paper make my stomach churn, people wiping their bums on virgin forests is just not an option these days!